Your baked bean tin cakes should be nicely fed now so it’s time to get covering them in marzipan. You need to leave at least 24 hours between covering the cake marzipan and icing to allow the marzipan tp dry and stop the oils from the marzipan leaching and spoiling the white icing. One of the reasons for covering a fruit cake in marzipan is to act as a foundation for the icing. It’ll help to hide the major lumps and bumps of the cake beneath. I have been known to make my own marzipan and there is something really delicious about homemade marzipan but this year due to time constraints I went for the shop brought variety which work just as well but can sometimes be a bit sweeter. It really doesn’t matter if you use white marzipan or yellow marzipan. I use the top and collar method (I don’t know if this is the correct term, but it’s what I call it!) for covering the baked bean tin Christmas cakes as it gives the tidiest result. If you wanted to cover the cake with one piece of marzipan The Pink Whisk has a fabulous tutorial.Just like with lining the mini tins decorating the cakes doesn’t take 1/12 of the time of a 8 inch cake, it still takes more or less just as long. When doing photos like this I should really stop being lazy and set up the tripod. Trying to brush a cake with my left hand while taking a photo with the other hand isn’t the easiest task! If you want to see more detail on the photo above, click on it. 1) Place a blob of glace or royal icing in the middle of the cake board. This will be the glue that sticks your cake to the board. 2) You want your cake to be straight and level. The easiest way to achieve this is to turn your cake upside down as the bottom will provide the flattest top. If need be slice a small amount off the new bottom to help level the cake. 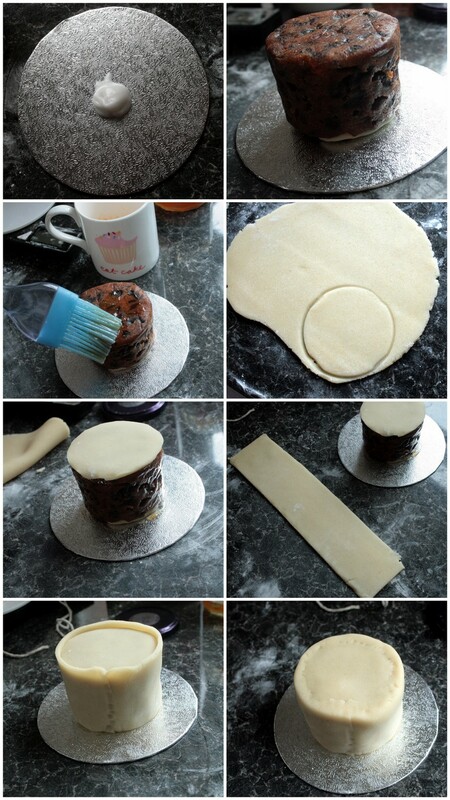 Also use small blobs of marzipan to patch any holes in the cake and jack it up from the bottom. 3) Thin a small amount of apricot jam/glaze with freshly boiled water, then brush over the cake. This will help the marzipan stick. 4) Dust the worktop surface with a small amount of icing sugar. Roll out the marzipan until it is about 5mm thick. Cut a round the same size as your cake. Place the round on top of the cake. 5) Using a piece of string measure the circumference of the cake. Roll of strip of marzipan that will wrap neatly around the cake. 6) Stick the marzipan to the side of the cake and smooth the edges together. 7) Allow to dry for a miniumum of 24 hours. How to decorate your Baked Bean Tin Cakes. Posted on December 5, 2011, in baking, Cake, celebrations, Christmas and tagged cake decorating, Christmas cake, marzipan. Bookmark the permalink. 5 Comments. If you brush your marzipan with gin or vodka and let it dry you can ice the cake the same day. Thank you for that great tip Janilizi. I hadn’t heard of that before. I use gin or vodka to stick fondant to fondant when decorating cakes. Good point about the length of time it takes to do small things vs big versions. Easy to underestimate. Loving these minis!